Hank Anuku, is not your every day Nollywood actor. With a voice like a gangstar, he often evokes different feelings from different people. Sometimes his role in the movies as a bad guy is not at variance with his real life activities. He often abandons his jeeps to ride on racing motor bikes on the streets of Lagos. Asked when he started acting, Hank would often retort that he started from heaven, "because that was where my father and Creator is," adding that : "I don't know the exact date", adding a mysterious angle to his character. Before making waves in Nollywood, Hank had been involved in movies overseas and did quite a few movies there. 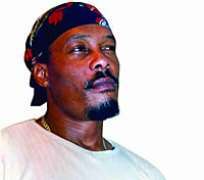 When he came home on vacation years ago, he met Regina Askia, who asked him to do some projects with her. He was born in Ibadan many years ago, where he attended Loyola College, Ibadan, and later attended Auchi Polytechnic, where he finished in 1981. His father was a first republic minister in the old Western Region, and held the portfolio of Economic Planning under the Action Group government. "My father had always been in Action Group and when the Unity Party of Nigeria came up, Chief Awolowo went to our village to look for my father. There, he was given the news that my father had passed on. He had to cancel his campaign that day because my father was the link of Chief Awolowo in Ikaland," he said in an interview. Since he ventured into the movies, he has appeared in The Sanatorium, My Love, Desperadoes, Broad Daylight, The Skeleton and many other best sellers. As an actor, though he plays the tough guy roles, he could also play different kinds of characters. He has also featured in a Yoruba movie titled: Ogidan. With his physique, women should be flocking around him. Does Hank feel threatened by such supposed show of love? He would say he didn't come into the movie industry for women "but to build up children." "to make them comfortable and to let the light shine upon them." What advice will you give to young up-coming artistes in the movie industry? I am going to tell them to be prayerful and have their feet rooted in good soil so that they don't lose their mustard seed. I have to tell them to understand that there is no need to back bite or murmur or be jealous of one another because everybody is a star. God created us as equals in his sight. There is no cheating.